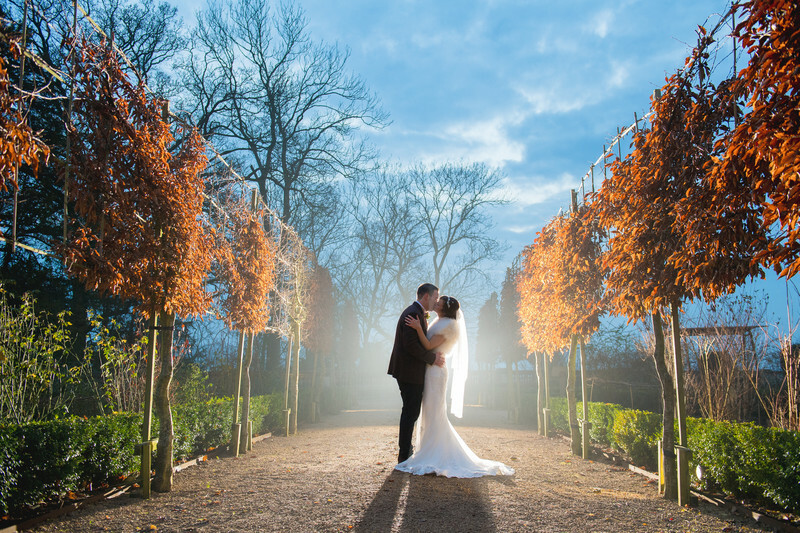 The Wood Norton Hotel in Worcestershire is a perfect venue for stunning weddings. I've said it before and I'll say it again - the venue really does have everything. There's an beautiful room in which the bridal party can get ready in the morning, a lovely ceremony room on the ground floor and a beautiful glazed orangery for wedding receptions. 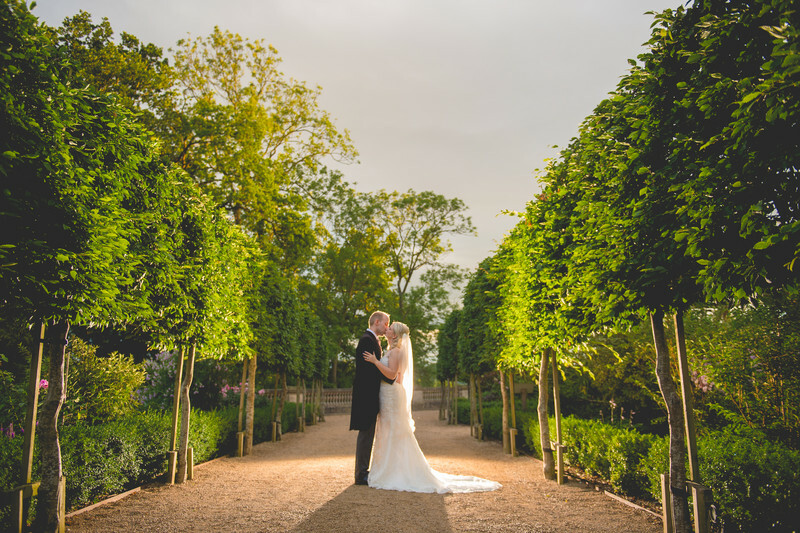 The grounds of the Wood Norton Hotel are a perfectly maintained as the inside of the hotel, with a large lawn (which now allows you to have an outdoor wedding at the venue) as well as a formal garden and stunning flowerbeds. I took the inspiration for this image from a very similar image that I had taken at the Wood Norton Hotel only a few months before. At Emilie and John's Christmas wedding, we had limited time in which to complete all of the wedding photos. The bride and groom had remained in the hotel with myself and the wedding coordinator, whilst the wedding guests were moved up to the top of the hotel's grounds where the Orangery is. We had a few minutes to take some images in the garden, when all of a sudden the weather turned. The wind picked up, clouds blew in, as did an ever-thickening blanket of fog. I hastily placed the bride and groom centrally in one of the gardens at the Wood Norton, evenly placed between two lines of trees which were reddish brown owing to the time of year. I placed an off camera flash behind the couple, and made sure it was facing back towards me. I took only three photos before the fog became too thick - the image above being the very first one that I snapped! For David and Laura's wedding, I knew that I wanted to recreate this image as it had proved very popular with everyone that had seen it, as well as the Wood Norton staff. The problem for me was that David and Laura got married in June, meaning it wasn't going to get dark until gone 10pm. To make things even more difficult, during their wedding reception, it had started raining. It was really late in the evening when the rain stopped, and I had been close to giving up on trying to get this image. I walked the bride and groom down to the location and set up my flash as I had for the image from Emilie and John's wedding. I took a number of photos and the one at the top of this article is my favourite. Both couples are standing in the same place, in the same pose at the same venue, but both images have a very different feel, which goes some way to showing the differences between these two Wood Norton weddings. John and Emilie's wedding was in December, it was a cool day and this is shown in the blue tones of their wedding photo. David and Laura's wedding day was in summer, and was very warm - this is equally reflected by the warm tones in their version of this image. I am very pleased to say that as of 2017 I am one of only three recommended wedding photographers at the Wood Norton Hotel in Worcestershire. I enjoy working closely with this amazing venue in order to make sure my clients get the very best from their wedding day.